Where is Nigel when you need him? Territory CLP Senator Nigel Scullion will not be on tonight’s Q&A panel and will be replaced by Queensland independent Bob Katter (at right) whom the program’s moderator, Virginia Trioli, describes as a maverick. Mr Katter’s link to Alice Springs is no more than that his electorate of Kennedy adjoins the NT but then stretches all the way to Innisfail in Queensland. Half the panel is Aboriginal and perhaps that is a recognition of the town’s much decried “Aboriginal problem”. But while the three Indigenous members will have important insights to share from their own personal and professional perspectives, that “problem” needs a whole of community response. Yet Dale McIver, as the chairperson of Tourism Central Australia, is the only representative of the town’s active commerce. Why are there no representatives of employers, educators, law enforcers, environmentalists, planners on the panel? And then there is Warren Snowdon, the Member for Lingiari, and a former employee of the Aboriginal Central Land Council (CLC). He is currently the Shadow Assistant Minister for Indigenous Health, an inexplicably long-serving politician with a string of minor jobs in Canberra over decades and noted in is home patch for his lack of initiative and creative policy development. Senator Scullion would of course have been the obvious foil for Mr Snowdon – one Federal politician versus another, and from opposite parties. That the good Senator wasn’t going to play ball became obvious when Ms Trioli closed last week’s show with these words: “Unfortunately, no relevant senior government Minister could join us in Alice Springs (side glance at Christopher Pyne, a panel member last week). Senator Scullion this morning would not disclose the reason for his absence. What has become clear is that his preferred contact with the public is a barrage of media releases including on the most insignificant issues. Sample: Friday, 30 June 2017 – A new change room will be built and additional lighting installed to increase safety levels at Boggabilla Oval, thanks to a $236,000 grant from the Coalition Government. Wow. More curly issues get ignored. Sample: Email on May 29 from the Alice Springs News Online to Senator Scullion’s Senior Media Advisor: What is the value of assets owned by Centrecorp (in which the CLC is the biggest shareholder as well as an instrumentality answerable to Nigel)? These assets, held by what is conveniently structured as a Pty Ltd company, which has little transparency, are believed to be in the hundreds of millions. Tangentyere and Congress are shareholders. Dr Josie Douglas, a Senior Policy Officer of the Central Land Council (CLC). William Tilmouth, former Tangentyere boss and now on the board of the $40m a year Central Australian Aboriginal Congress. Town councillor Jacinta Price, who appears to be settling into the mantle of national spokesperson on issues of Indigenous domestic violence inherited from her mother, Bess Price, who faded from politics in the NT Labor landslide last August. FROM LEFT: Snowdon, Price, McIver, Douglas, Katter, Tilmouth. PHOTO from ABC website. Amid all the hoo-ha of the cost of air fares, it is increasingly ironic that Jacinta takes an opportunity in NAIDOC week to pursue a really critical issue of domestic violence while the pollie boys complain about frequent flyer points. What is more important on Q&A – directly addressing critical social issues on the ground, or stressing about the cost of travel for gawkers who want to come to Alice for a holiday? Q&A is a Luvvie gabfest that thrives on minority cause issues when raised by so-called “progressives”. Jacinta is apparently not from the ABC-approved “progressive” lobby so, surprise surprise, Q&A gets carried away with the entertainment triviality of air fares. We are lucky to have an airline service – most small towns in Australia do not. Price gouging? Probably just the cost of running a service for a small population. Many business here could probably be accused of the same thing. @ Qantas is gouging: Q and A Political Comment (Posted July 3, 2017 at 10:30 pm): I remember the bad old days of Commonwealth control – Alice Springs was serviced by TAA, Ansett-ANA, East-West Airlines, and Connellan Airways (Connair), the last mentioned by which one could fly to almost any destination in the Northern Territory. Have we advanced since then? I’d say not. Warren Snowden said Qantas is price gouging. 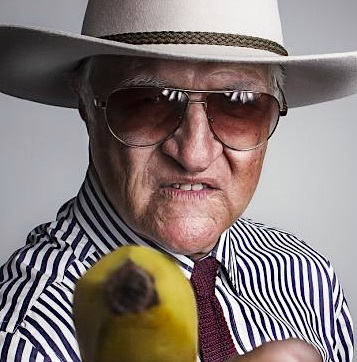 Bob Katter said Qantas should be thrown out of Alice Springs. Dale McIver agreed. Qantas flight prices are ridiculous. SO WHEN WILL ALICE SPRINGS GET A REAL AIRLINE? Onya Bob – this is going to be classical ABC and Nigel would have been crucified – for being Nigel.